Line the bottom of a pie crust with sliced strawberries. Combine cornstarch, sugar and water in small saucepan. Bring to a boil and simmer, stirring constantly, until thickened. Add the Jell-O™ and stir until dissolved. Pour gelatin mixture over strawberries and refrigerate until set. There’s no arguing that strawberry pie is a delicious dessert in its own right. However, jello strawberry pie is a delicious dessert experience. In other words, if fresh strawberries, sweet strawberry jello and a buttery pie crust aren’t your thing, we’re not sure what is. 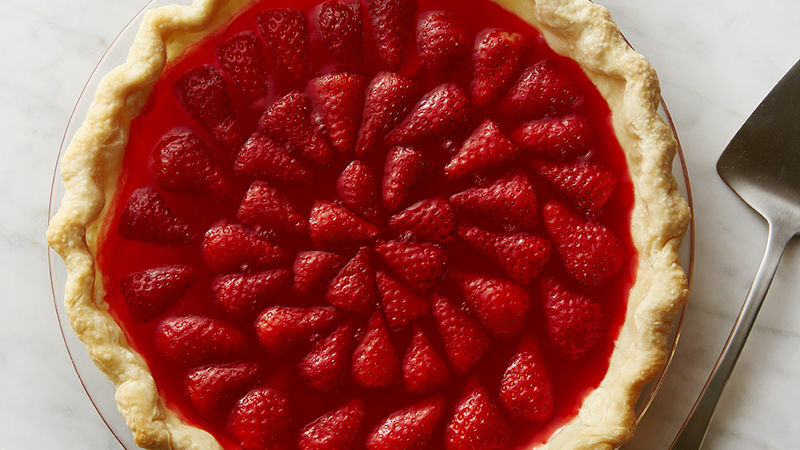 You may be wondering what’s “retro” about this strawberry pie. Back in the 1950s and ‘60s, gelatin-based recipes were introduced in cookbooks and it quickly became a trend (looking at you, jello salad!). We’re bringing it back with this recipe because the oldies are the goodies! We highly suggest serving this pie and every other pie for that matter, with a heaping dollop of whipped cream. You can even take it a step further and transform this recipe into a creamier decadent dessert by folding heavy whipping cream right into the sauce pan.